Still, Kolchak was highly influential in the horror scene, even to this day. Chris Carter, creator of the X-Files, lists The Night Stalker series as being a primary inspiration for his acclaimed series about FBI agents investigating supernatural phenomena. In fact, he went so far as to cast the star of Kolchak, Darren McGavin, in two homage-laced episodes as retired FBI agent Arthur Dales, who was the first agent assigned to what would become the Bureau’s X-Files department. So notable was this declaration by Carter that a reboot of the Night Stalker series was launched in 2005, to fairly dismal response and rapid cancellation. Kolchak: The Night Stalker – The Lovecraftian Horror, finds Kolchak assigned to cover a case first reported on by another news service. Carl Kolchak’s Editor, Tony Vincenzo, is livid that they have to follow a competitor’s lead, and orders Kolchak to get the scoop: A strange, half-fish, half-man creature has washed up on the beach in northern California. This in itself is remarkable, but Kolchak has no idea exactly what is in store for him, or how close he will come to facing something more mind-shattering than in any of his previous cases. Fusing Kolchak with Lovecraft seems like a natural leap, and the artists carry off this mash-up superbly. The story in this graphic novel – unlike most – is told mostly in text format, with a single, large illustration occupying the center of each page and text blocks at the top and bottom. It’s a style that works well for this genre; horror is always most effective when the imagination is given a great deal of room to maneuver on it’s own. Each illustration is lovingly detailed, and my hat’s off to Jaime Calderon for his impressive illustrative work on this book, especially for his faithful renderings of Darren McGavin and SImon Oakland, the actors who portrayed Carl Kolchak and Tony Vincenzo, respectively. The story itself is solid, and C.J. Henderson adds more than a few typical Lovecraft memes to keep the reader in the right frame of mind. The mood of this piece is dark and mysterious – as it should be – but there’s a twist to the story that I found delightfully unexpected. As usual, things are not all what they appear to be, but not in the way one might anticipate with a Lovecraft-inspired tale. I liked this story; the more I’ve thought about it, the more it grew on me, until finally I reread it and discovered layers of nuance I’d missed the first time through. Kolchak’s style isn’t everyone’s cup of protoplasm; he is abrasive, manipulative and suspicious – useful qualities in a reporter – but in this tale the hard-bitten snoop meets his match in terms of the situation’s gravity; because of the circumstances Kolchak finds himself willingly making deals he never thought possible, and it helps portray the character as more sympathetic, more human. 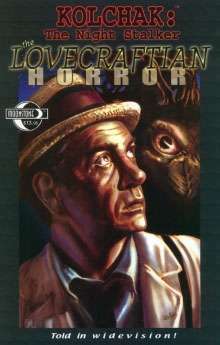 I enjoyed Kolchak: The Night Stalker – The Lovecraftian Horror a great deal. Afficianados of both Lovecraft and of Kolchak will find much to appreciate in this book; casual horror fans will too.